The Aqua-lug project requires student teams to build a device that can move a bottle of water along a tile floor. 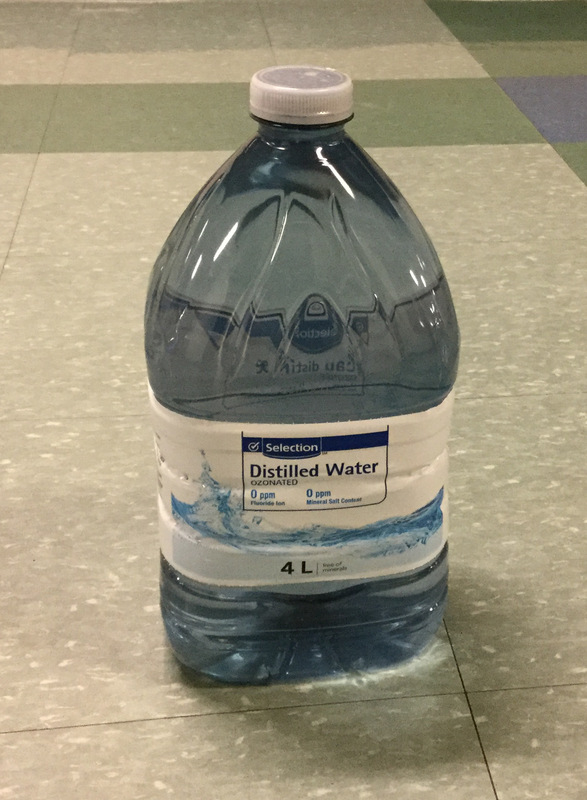 The particular bottle that will be used is the Selections 4L Distilled Water which can be purchased at Food Basics. Teams will be given 5 minutes to perform three attempts at moving the bottle between two parallel lines spaced 10 feet apart. The device must be self-supporting. No human intervention can be used to hold or stabilize the device during operation. Adhesives may not be used to affix any part of the device to the floor. Testing will take place in the hall outside of room F-228. The device and all its parts will be weighed. When placed on the scale, no part of the device may extend beyond the limits of the measuring tray (54cm by 42cm). Teams may arrange parts as needed to ensure compliance. There will be a 10% penalty for exceeding these limits. 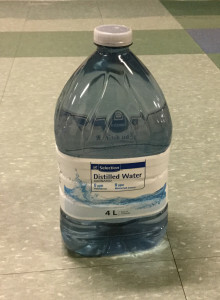 The bottle will be positioned at one line. The bottle will be oriented with the short edge parallel to the start line. Teams will then be given 5 minutes to make three attempts at moving the bottle up to 10 feet. No part of the device may touch the floor or bottle before time has begun. Team members may do whatever preparation is necessary during their five minutes but may not move, lift, or reposition the bottle in any way. The device, or parts of the device, may interact with the bottle in any way that does not permanently alter or damage it in any way. There are no limitations to where the device can be located on the floor. Only the distance travelled by the bottle will be considered for scoring. The device may be activated in whatever way is most convenient. However, once it has been activated no team member may interact with the device, affect its functioning, or interact with the bottle. There will be a 10% penalty for every unauthorized interaction. Time will be paused once (i) either the bottle has moved past the finish line or (ii) forward progress has stopped. The distance travelled perpendicular to the start line will be measured and recorded as shown below. The bottle will then be reset at the finish line. Timing will be resumed and teams will have to reconfigure their device to convey the bottle in the opposite direction. A maximum of three tests can be run in the 5 minutes allowed. The travel direction will be reversed with each test. If time expires while a test is on-going, the approximate position will be marked and used as the basis for the distance measured. The average distance from the three attempts will be used to evaluate the performance. Teams that perform fewer than three attempts receive zero on the remaining ones. Costs must be calculated using the list price on an official website, regardless of the actual purchase price. The cost of wood or other material may be scaled based on the number of useable parts that could be machined from a given raw piece of material. This is different that the area or volume of material used. Two rounds of testing are performed using two iterations of the design: a prototype round, and a final round. Scoring during the prototype round is relative, whereas the final round testing is an absolute scoring system determined based on the prototype results. In both rounds the total score is based on a weighting of 55% for average distance, 30% for cost, and 15% for weight.